"We're sitting on the biggest bomb man's ever made." Husband and wife team, Gerry and Sylvia Anderson, were responsible for a number of marionette-based British science fiction series in the '60s and '70s, including Fireball XL5, Thunderbirds and Stingray, and they also wrote the 1969 live action feature film Doppleganger (released on DVD as Journey To The Far Side Of The Sun). Following the demise of their first non-puppet TV series, UFO, the Andersons set out creating their second live action endeavor, which ended up having the highest budget for a British television series to date. 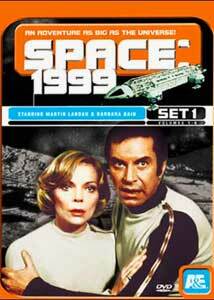 Recruiting husband and wife team Martin Landau and Barbara Bains for the leads, Space: 1999 was launched in September 1975. Featuring elaborate miniatures, special effects and futuristic costuming and set design, the series ran for two seasons. Abrupt changes in the writing and direction of the show led many to criticize the second season, though as a kid, these were the episodes that got me hooked. In set one, we have the first six installments, but their running order doesn't follow any linear progression past the first episode. In Breakaway, Commander Koenig takes his post on Moonbase Alpha, which is the site for a program launch to the recently discovered planet of Meta. There are some serious problems on the base though, as members of its crew are dying from a strange plague. The resident doctor, Helena Russell (Barbara Bain) suspects these deaths are due to radiation exposure from the containment areas that the Earth has set up on the moon to store its radioactive waste. As Koenig, Russell and Professor Victor Bergman (Barry Morse) investigate the fatalities, they discover a problem that will ultimately spark a catastrophe that causes the moon to be cast out of Earth orbit and hurtling into deep space. This episode rates 5 moons out of 5. A Matter Of Life Or Death finds the crew checking out a planet that is a possible candidate for their relocation. When the survey shuttle returns with an extra passenger, explanations are few and far between—especially as the passenger is Helena's husband Lee (Richard Johnson), who has been presumed dead for the past five years. Will the crew of Moonbase Alpha have themselves a new home, or does Lee harbor a shocking secret about the planet? After averting certain destruction from a collision course with an asteroid, what could happen that could be worse? How about the birth of a black hole, which they are heading straight for? Koenig must choose a crew that can escape to safety, but can Victor come up with a way to avoid the inevitable in time, or will they meet their deaths in the Black Sun? It all starts with a maintenance worker who goes berserk and dies in Ring Around The Moon. After a ring of yellow light engulfs the moon and a message stating they are prisoners of the planet Triton, Helena is kidnapped and becomes a conduit between the moonbase's computer and the mysterious force holding them captive. Koenig must find a way to break the link between Helena and this force before she, too, is killed. Christopher Lee guest stars as Captain Zantor from the planet Kaldor, whose ship crash lands on the moon on its way to Earth. When the moonbase personnel accidentally kill one of the Kaldorian crew, the Kaldorians invite one member of the crew to return to Earth with them. Koenig decides to let the computer pick a worthy candidate, but Zantor and Commissioner Simmonds (Roy Dotrice) have different ideas. Which crew member will eventually be Earthbound? The final episode in the set is Another Place, Another Time, in which the moon's inhabitants find themselves face to face with the future. After another unexplained phenomenon, Regina Kesslann (Judy Geeson) is the only crew member seriously affected, though she rambles on about two moons and her husband Alan Carter (Nick Tate) and Commander Koenig being dead. The problem is, Alan doesn't even know her! Something strange has happened, and the moon is now billions of light years from its former position, on course to take its place around the third planet of this new solar system. Is what lies ahead really what they've been looking for? Although the series was criticized for its tendency towards fiction rather than science fact, as a youngster, the show offered a plausible scenario, a rich dosing of special effects and some of the coolest space craft designs in the Eagles. It was not quite as campy as Star Trek: TOS, (shields up for that comment) and certainly more futuristic, with the crew's remote control devices (which house little TVs and are used, nonergonomically, for opening doors) and their stun lasers. Space: 1999 offered a view of the (then) future that looked exciting, while its underlying context extolled the evils of atomic proliferation. Rediscovering the series two years after its timeframe setting, it is somewhat sad to see that mankind's progress hasn't lived up to the vision we had from the 1970s. Still, Space: 1999 looks better than ever on DVD, and for fans of the science fiction genre, should be a welcome addition to the collection. Image Transfer Review: Remastered form the original 35mm film, these discs look extremely good for a TV series. There is a fair amount of shimmer and interference in objects with dense horizontal lines such a grill covers, and some rainbowing in the model shots. Aliasing is also present in small doses, but despite these issues, the rest of the presentation is fantastic, with very little dirt or other film damage present. Colors have that muted '70s look, but are as vibrant as pale orange and lime green can get. Blacks are solid, and artificial sharpening is at a minimum. I don't remember the broadcasts being this detailed. Audio Transfer Review: Sound is presented in two-channel mono, and is suitable to the programming. It doesn't offer much in the way of extended frequency range, which is not surprising since it was mixed for the 3" speakers in most TV sets of the day. It is cool to hear that theme song again, with its fuzz box guitar work, and '70s whack-a-chucka wah pedal accompanyment. Extras Review: Extras are a bit short, limited to a stills gallery on each disc, though these do contain an alternate title treatment and some promotional art along with a few behind the scenes shots and stills from each episode. Set 1 is housed in a very seventies orange box, with the insert card duplicated in each DVD case simply listing the episode titles for the first wave of four discs. So far, the disc covers have only featured Landau and Bain, so I assume we won't be seeing any of the other inhabitants of the series on the artwork, which is too bad. I'd also like to see concept drawings for the space craft, set design and prop pieces included in future releases. The next pair of box sets is still a few months off, so we'll see what turns up then. It is great to see shows like Space: 1999 being released to DVD at this high level of quality. Though it has its shortcomings, the series is still enjoyable a quarter of a century after its creation. We aren't looking for brilliant performances or eye-opening concepts here, but we do have one of the best examples of British television sci-fi now available to own, and with a runtime of nearly five and a half hours for the set, it is also a bargain. Pull on your bell bottoms, grab your remote and prepare to leave orbit. Space: 1999 is back.